"Barbary" redirects here. For other uses, see Barbary (disambiguation). 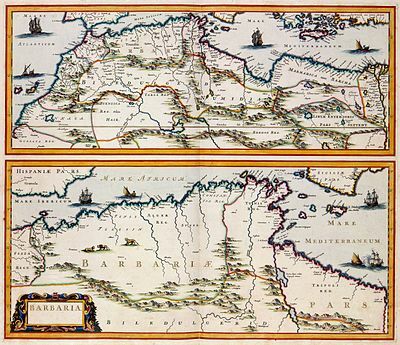 A 17th-century map by the Dutch cartographer Jan Janssonius showing the Barbary Coast, here "Barbaria"
The English term "Barbary" (and its European varieties: Barbaria, Berbérie, etc.) could refer to all the Berber lands whether coastal or not, as seen in European geographical and political maps published during the 17th–20th centuries. The name derives from the Berber people of North Africa, from Greek Bàrbaroi (Βάρβαροι) and the Arabic Barbar ( بربر ), meaning "barbaric". In the West, the name commonly evoked the Barbary pirates and Barbary slave traders based on that coast—who attacked ships and coastal settlements in the Mediterranean Sea and eastern North Atlantic Ocean, and captured and traded slaves or goods from Europe, America and sub-Saharan Africa. These actions finally provoked the Barbary Wars of the early 19th century. Before then, the territory was usually divided between Ifriqiya, Morocco, and a west-central Algerian state centered on Tlemcen or Tiaret. Powerful Berber dynasties such as the Almohads (12th century) and briefly thereafter the Hafsids, occasionally unified it for short periods. From a European perspective, Tripoli in modern-day Libya, was considered its capital or chief city—though Marrakesh in Morocco was the largest and most important Berber city at the time. Some[by whom?] saw Algiers in Algeria, or Tangiers in Morocco as the capital. The first United States military land action overseas, executed by the U.S. Marines and Navy, was the Battle of Derna, Tripoli (a coastal town in modern eastern Libya) in April 1805. 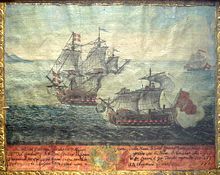 It formed part of an effort to destroy all of the Barbary pirates, to free American slaves in captivity, and to put an end to piracy acts between these warring tribes on the part of the Barbary states, which were themselves member states of the Ottoman Empire. The opening line of the Marines' Hymn refers to this action: "From the halls of Montezuma to the shores of Tripoli..." This was the first time the United States Marine Corps took part in offensive actions outside of the United States. 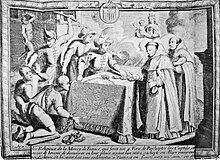 The modern word razzia is, via Italian and French, from Algerian Arabic ghaziya (غزية "raiding"), originally referring to slave raids conducted by Barbary pirates. ^ Carver, Robert (25 April 2009). "Not so easy alliances: Two Faiths, One Banner: when Muslims marched with Christians across Europe's battlegrounds (book review)". The Tablet. p. 24. Archived from the original on 2017-06-20. Chisholm, Hugh, ed. (1911). "Barbary Pirates" . Encyclopædia Britannica. 3 (11th ed.). Cambridge University Press. pp. 383–384.